Ideal for large groups visiting Barcelona, this spacious three bedroom apartment in Barcelona can accommodate up to seven people, making it great for families or friends visiting the Catalan capital. The area offers easy access to all the sights in and around the city, meaning that Barcelona will be at your feet! The apartment is sure to make guests feel right at home with a clean and comfy feel throughout. The large windows in the living room open up onto a balcony, and by allowing light to fill the space throughout the day, further adds to the spacious feel. Two of the bedrooms are furnished with double beds, while the third room has two single beds. A double sofa bed can also be found in the living room. This chic Barcelona apartment, complete with an Internet connection, is a wonderful choice for those looking to make the most of their time in Barcelona! Upon arrival, guests will be welcomed into the apartment with a complementary selection of breakfast delights to enjoy. Check-ins after 20h have an extra charge of 30€ and check-ins after 23h have a charge of 50€. The working hours of the owners of this apartment will be until 18:00h on December 24 and 31. Please arrange to check-in before 18:00h on these days. It is possible to pay the refundable damage deposit by debit/credit card when checking-in to this apartment. Last-minute reservations can be made for this apartment up to 8 hours ahead of arrival. This apartment has been inspected and verified by AB. This means our team of dedicated professionals carry out regular checks of the cleaning and maintenance of the apartment in order to provide you with the most comfortable and enjoyable stay possible. Eixample is Catalan for ´extension´, meaning an extension of the old Barcelona city. Eixample was designed by Catalan-born urban planning visionary, Ildefons Cerdà, who took traffic and sunlight (amongst many other things) into consideration when creating the plans for this new district. Eixample is now characterised by its octagonal blocks and its grid-like pattern, with wide streets and both commercial and residential areas. It is split into two parts, Eixample Esquerra (Left, or in Spanish, Izquierdo) and Eixample Dret (Right, or in Spanish, Derecho), both of which are home to some fantastic restaurants and stores. 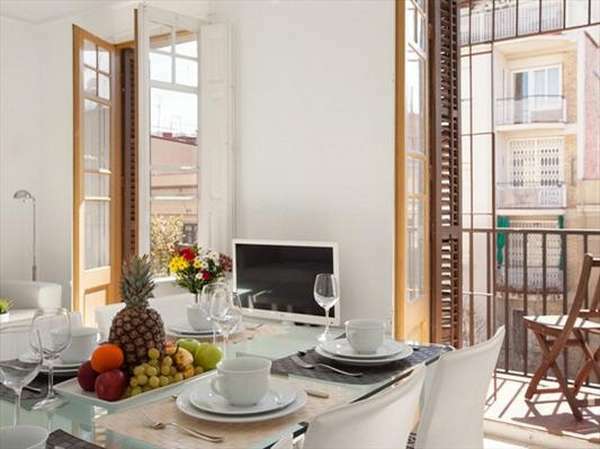 Eixample Izquierdo is delimited by the grand, Passeig de Gràcia, a paradise for shopping and dining, and Plaça d´Espanya, where the Montjuïc Magic Fountain and one of the biggest convention centres in Barcelona can be found. The Parc de Joan Miró, with its iconic ´Woman and Bird´ sculpture created by the Barcelona-born artist, is also situated here, as well as the Arenas shopping centre, which was once a bull-fighting ring. An apartment in Eixample Izquierdo is a great choice for your stay in Barcelona, due to its unbeatable public transportation services and its location, close to some of the best sights and attractions in Barcelona. To make a reservation of 11 months or more, please contact us directly. (1) Free cancellation up to 48 hours after making the reservation (local time). You will be reimbursed the full amount paid. (2) More than 48 hours after making the reservation (local time), the prepayment cannot be reimbursed; however, you can use it up to 10 days before arrival for future reservations. (3) If you cancel your reservation within 48h before your arrival, or in the case that you do not show, you will be charged the total amount of the reservation on the same credit card used when reserving the apartment. (2) If you cancel your reservation within 48h before your arrival, or in the case that you do not show, you will be charged the total amount of the reservation on the same credit card used when reserving the apartment. This reservation is not refundable because there are less than 7 days before arrival. (1) If you cancel your reservation within 48h before your arrival, or in the case that you do not show, you will be charged the total amount of the reservation on the same credit card used when reserving the apartment. (2) In the case that 48 hours have passed since the time of the original reservation, neither the first month of rent, nor the agency commission can be refunded. Either way, you are able to change the dates of the reservation according to the apartment availability and with a minimum of 30 days before arrival. (1) The prepayment cannot be reimbursed; however, you can use it up to 30 days before arrival for future reservations.